Peacocks roam the stately grounds of the San Anton Palace. It is the official residence of Malta’s president. A tiny traditional boat (called a dgħajsa) glides past the Maltese Falcon, a superyacht. The mighty Fort St. Angelo is in the background, as are the Three Cities. 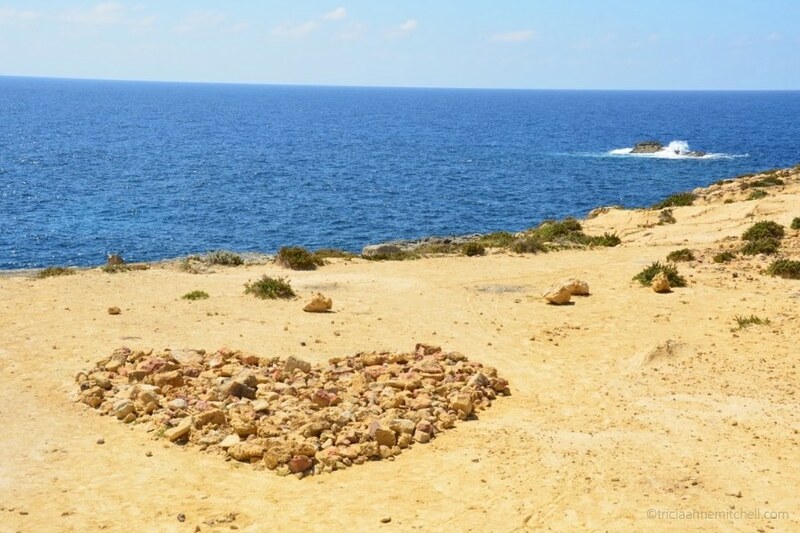 A heart, crafted out of rugged limestone, overlooks the sea from the island of Gozo. The iconic Azure Window — a natural arch — once stood nearby. 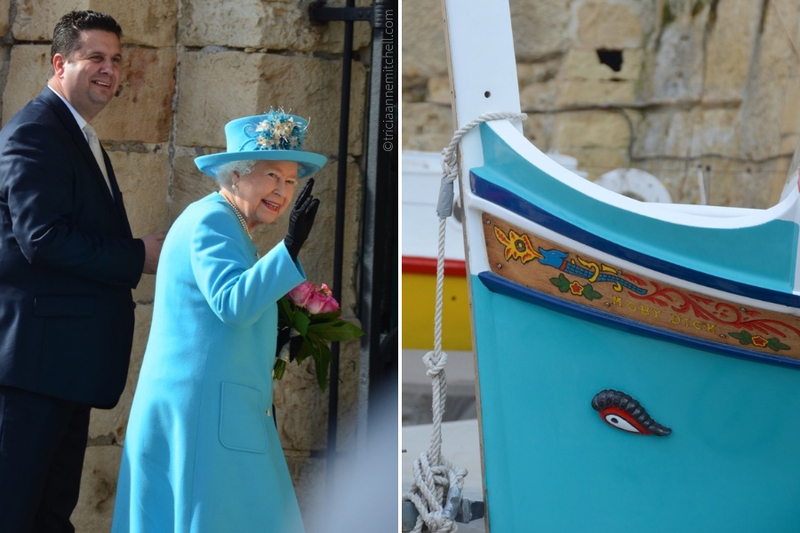 Queen Elizabeth visits Valletta (left), and the bow of a fishing boat (right). Eyes are often painted on Maltese boats, a custom that’s believed to date back to the time of the Phoenicians, who once ruled the island. 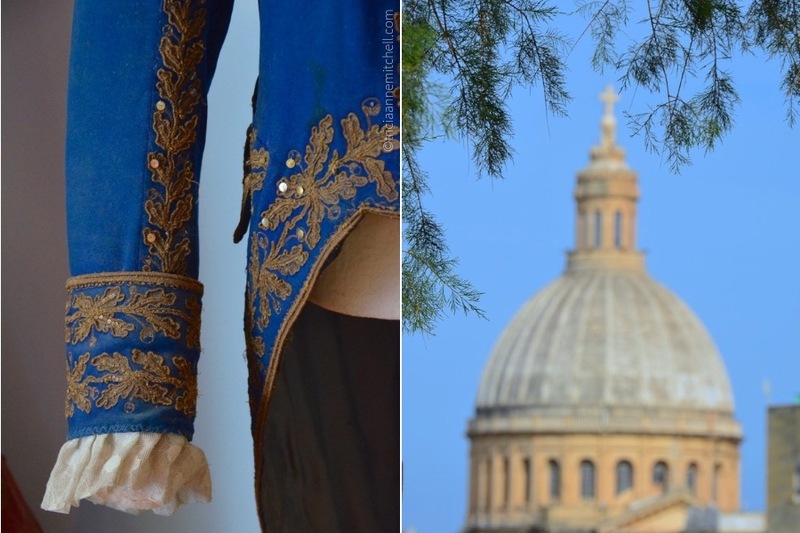 Detail of a costume on display in the museum of the Manoel Theatre (left) and the iconic dome of Valletta’s Basilica of Our Lady of Mount Carmel (right). A classic car drives on the coastal road near the scenic Dingli Cliffs. A dolphin-shaped door knocker (left) and a typical doorway (right). A weathered set of doors frames a slot for mail on a Valletta townhouse. Revelers celebrate the feast day of St. Paul in an enclosed balcony in Valletta (left) and an azure-colored doorway (right). A shuttered bar on Valletta’s once-infamous Strada Stretta (Strait Street). The area was the playground of sailors who were in port (left). A religious detail adorns the front of a home (right). Malta is overwhelmingly Catholic. The Lippija Tower overlooks Gnejna Bay. This defensive tower was built in the 17th century, during the time of the Knights of St. John. Malta’s sister island of Gozo is in the background. 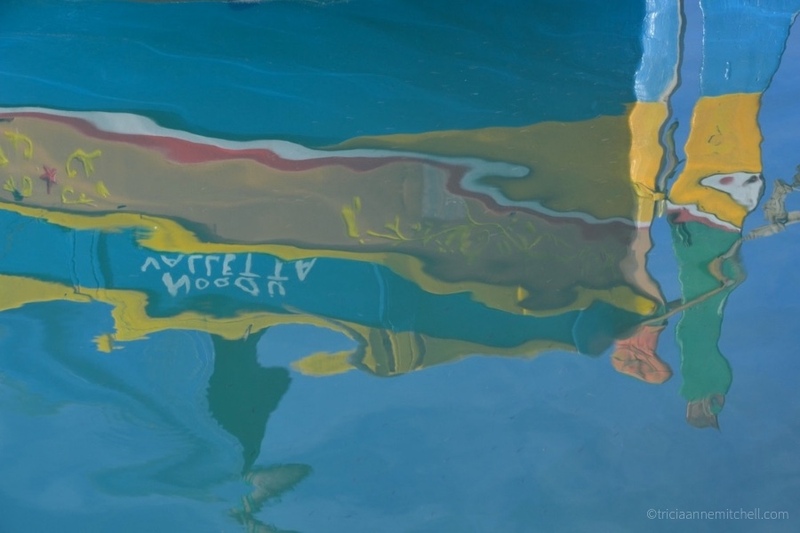 A colorful boat is reflected in the water of Marsaxlokk’s harbor. 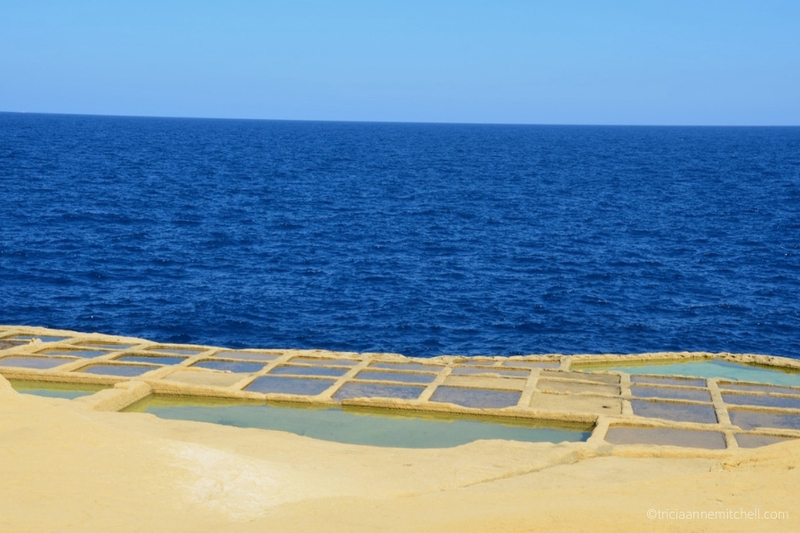 Salt pans on Gozo’s northern coast, on an early spring day. It’s believed that such pans have existed here since Roman times. People harvest the salt during the summer months. 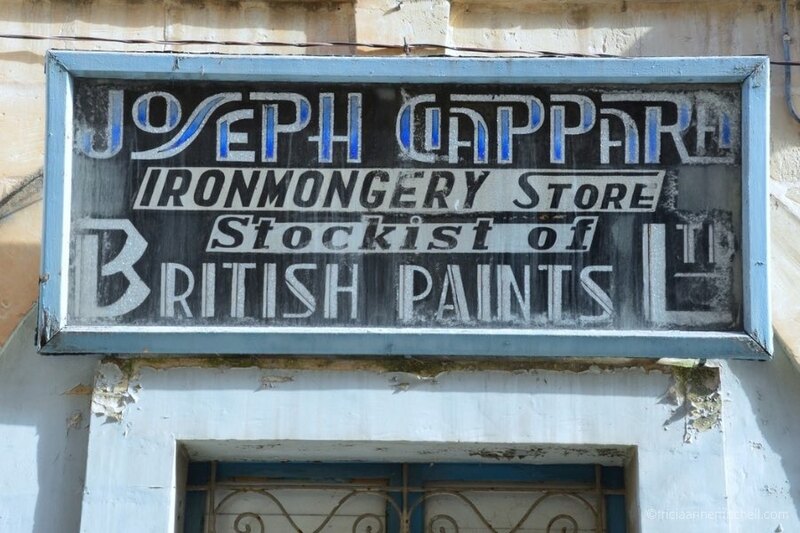 In Valletta, numerous classic storefronts still exist. This shop was once an ironmongery store (a hardware shop). 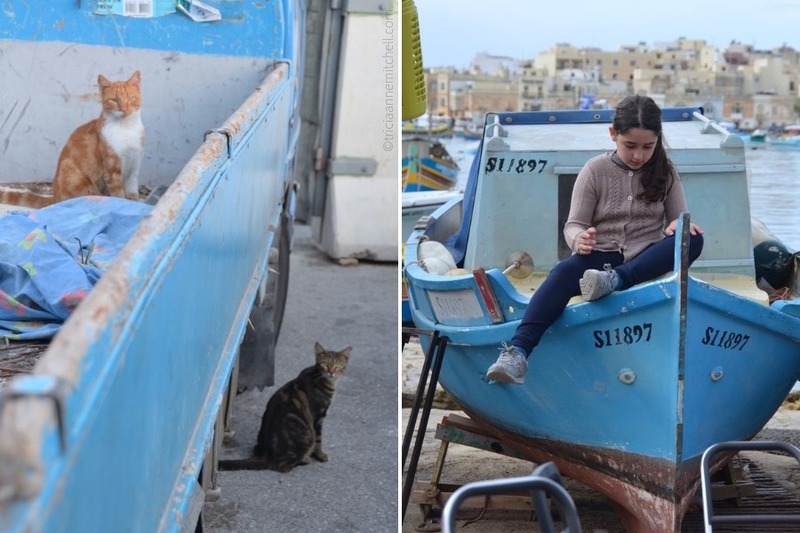 Cats stow-away in a Valletta truck (left) and a girl reads in a traditional fishing boat (right). 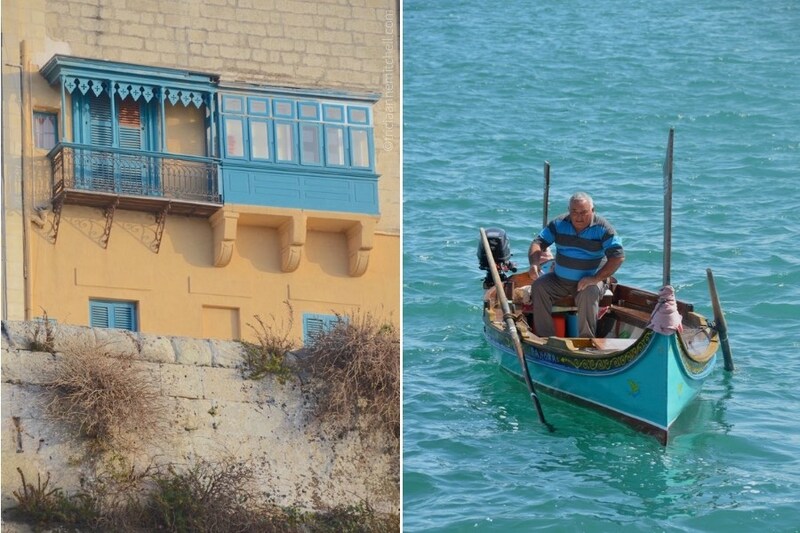 Gingerbread-like balconies in Valletta (left) and a man pilots a dgħajsa, a gondola-like boat, in Valletta’s Grand Harbour (right). 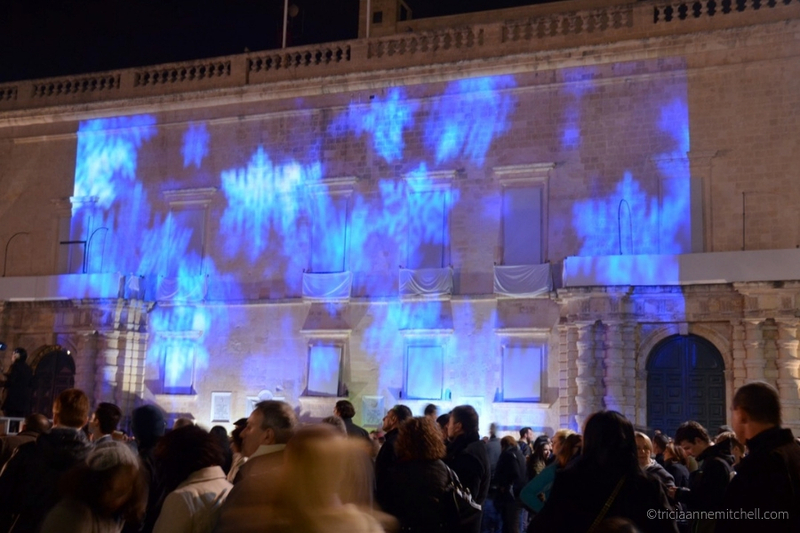 Neon-blue snowflakes are projected onto the exterior of Valletta’s Grandmaster’s Palace as part of the city’s New Year’s Eve celebrations. Airplanes fly in formation over the village of Safi during the Malta International Airshow. This event takes place annually. 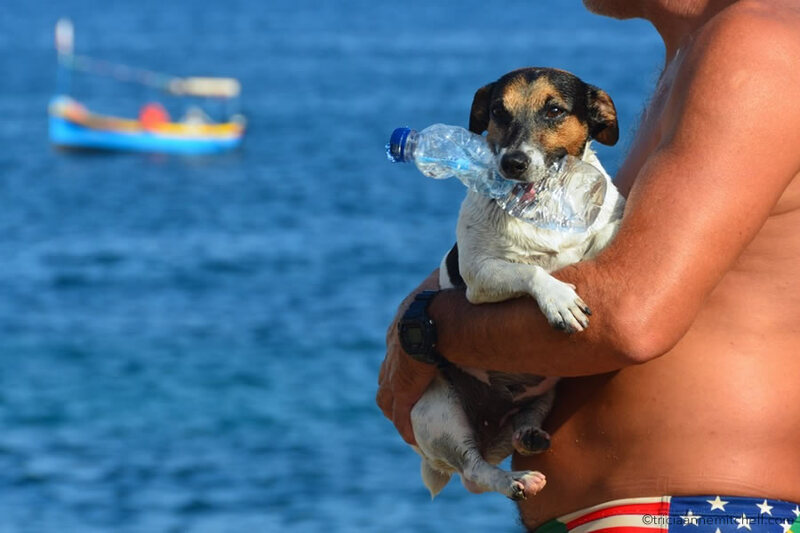 Titti, a world-famous Jack Russell Terrier who makes synchronized dives with her owner, Carmelo. 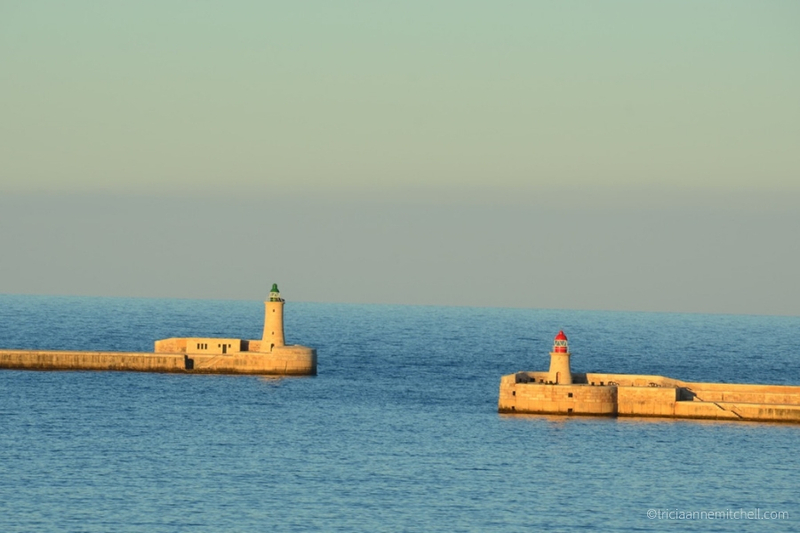 The breakwater near Valletta’s Grand Harbour. 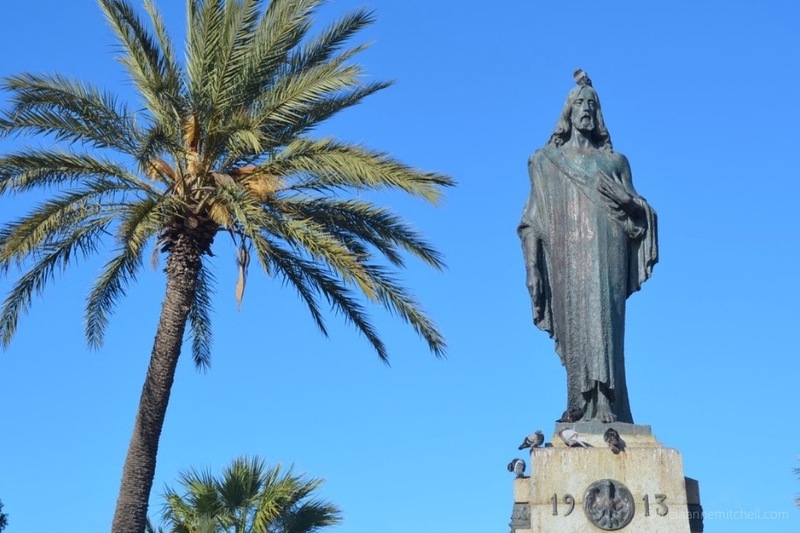 A pigeon rests on a monument in Floriana. 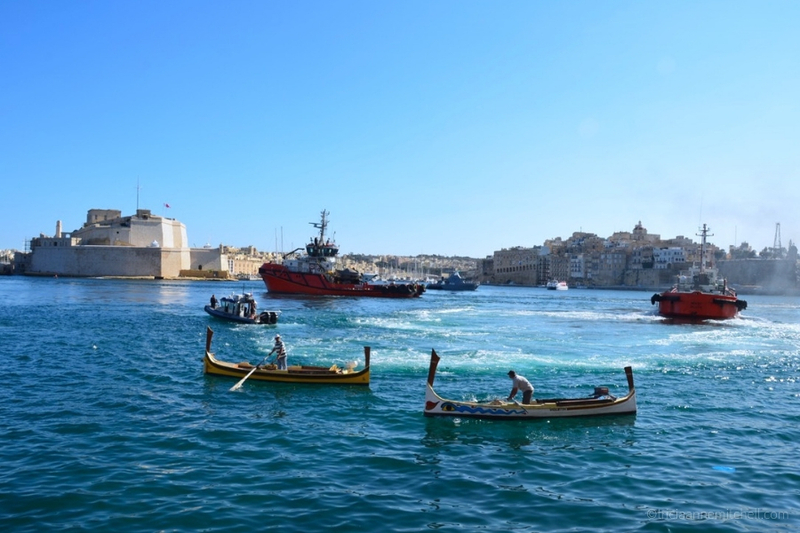 Dgħajsas and tugboats take to the water of the Grand Harbour. Malta’s rugged coastline (left) and a golden-limestone building with blue accents in Mosta (right). The streetlights of Valletta (left) and a religious statue tucked into a niche (right). 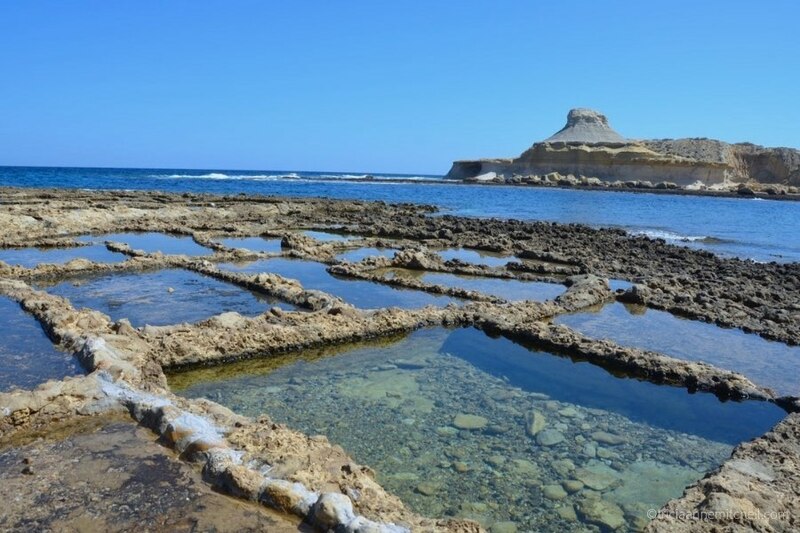 Checkerboard-like salt pans on Gozo’s northern coast. 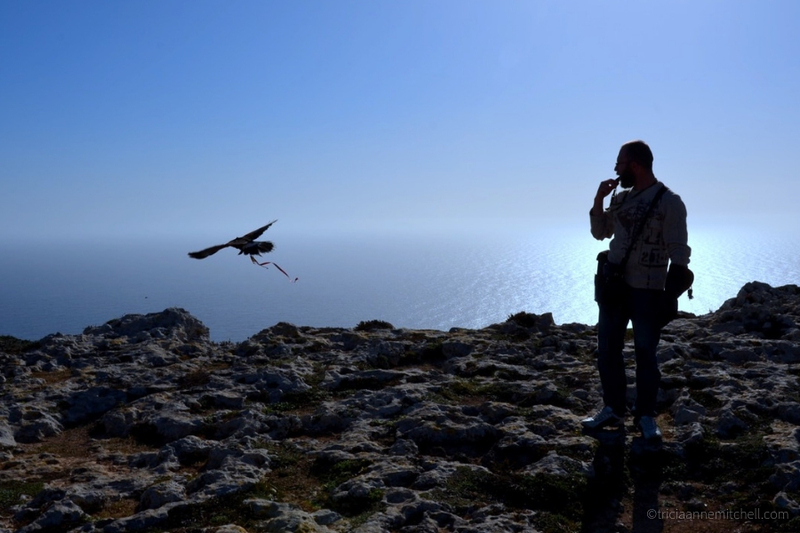 A man trains his Harris’s hawk along the majestic Dingli Cliffs. A Maltese cross (a symbol of the Knights of St. John) adorns a door knocker in Valletta (left). A shoe shop’s vintage storefront (right). 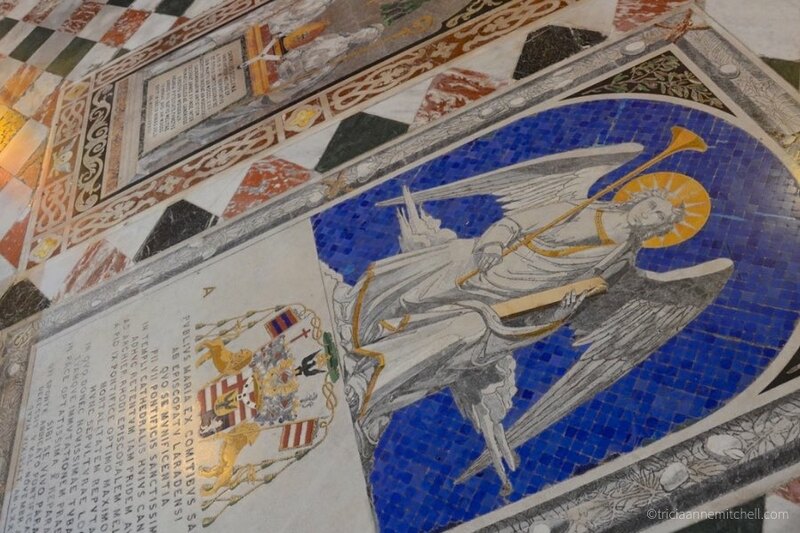 The floor of the Mdina Cathedral is covered in a patchwork like-quilt of colorful tombstones. 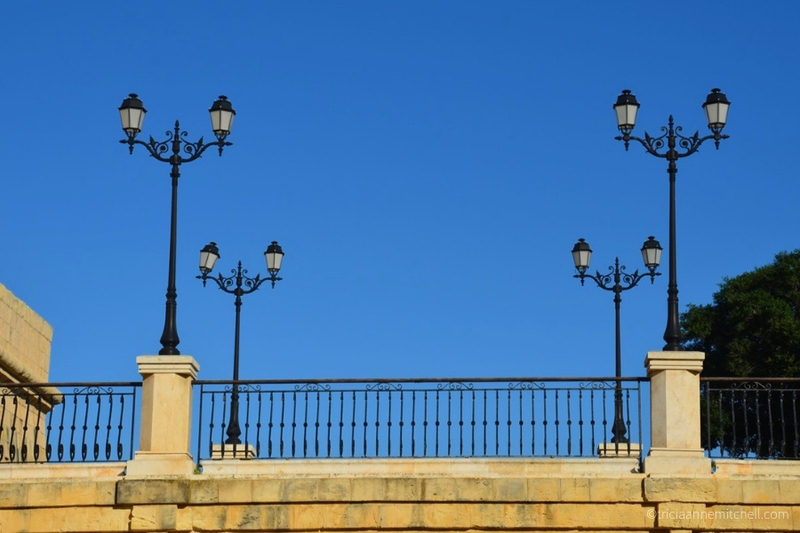 Lamp posts in Birgu, near the Malta at War Museum. 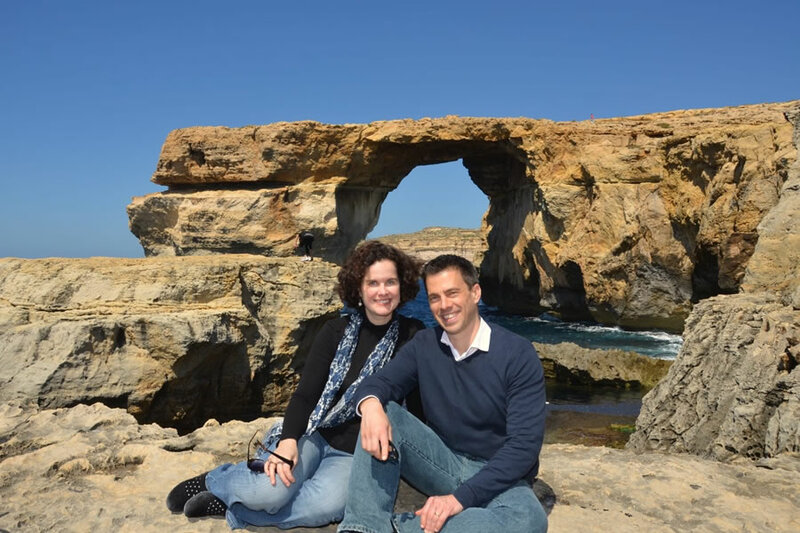 Shawn and me, with the Azure Window behind us. The picture was taken about one year before the natural formation collapsed. 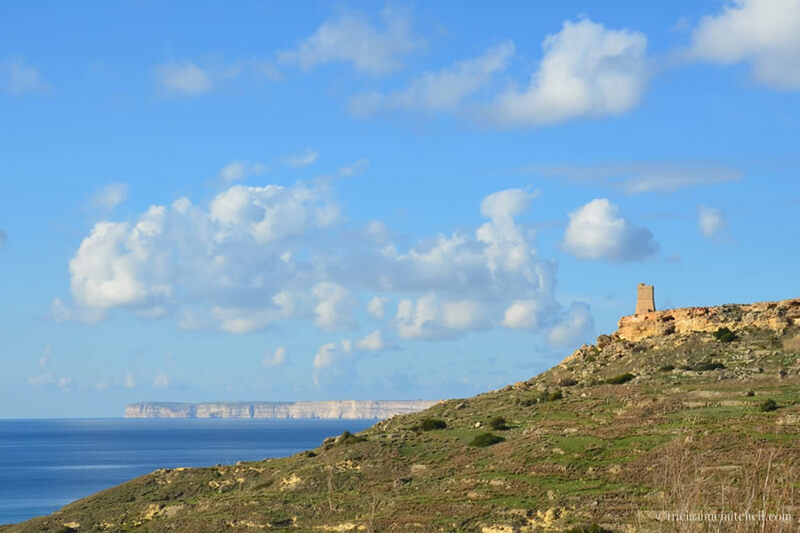 Despite it no longer being there, there’s much to experience on Gozo. The uninhabited island of Filfla. Today, it is a peaceful nature preserve, however, Filfla was previously used by pirates as a hiding spot so they could surprise and attack ships. NATO and the British also once used Filfla for bombing target practice. 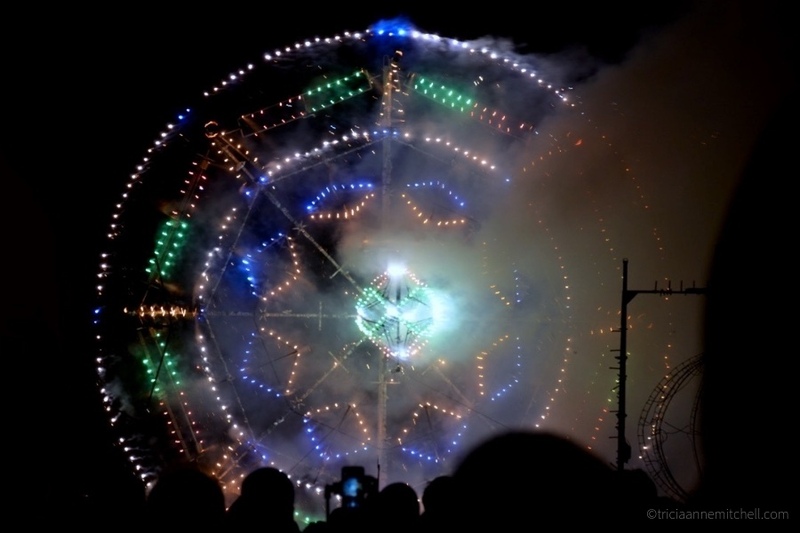 Close-up of a pyrotechnic display, the day before Malta’s annual Mechanised Ground Fireworks Festival, in Floriana. Spectators capture the vibrant ground fireworks using their mobile phones. 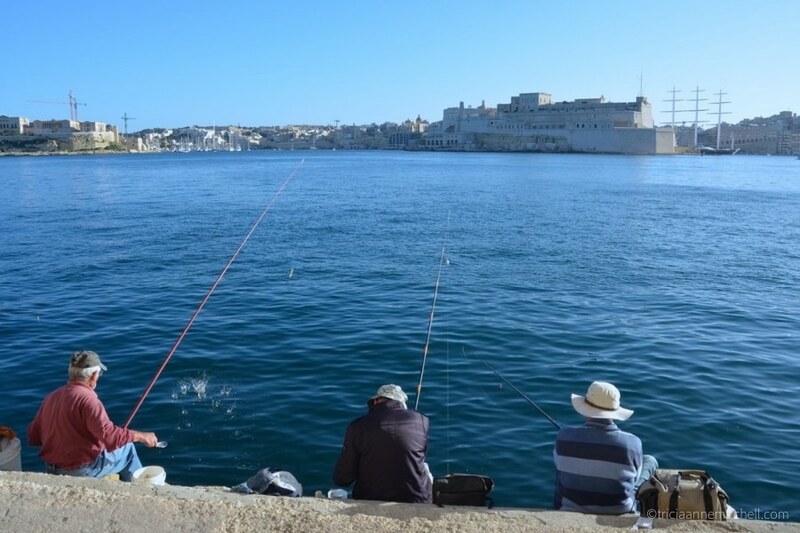 Three men fish in Valletta’s Grand Harbour. They didn’t seem to be catching much, but appeared to be enjoying soaking up the sunshine. 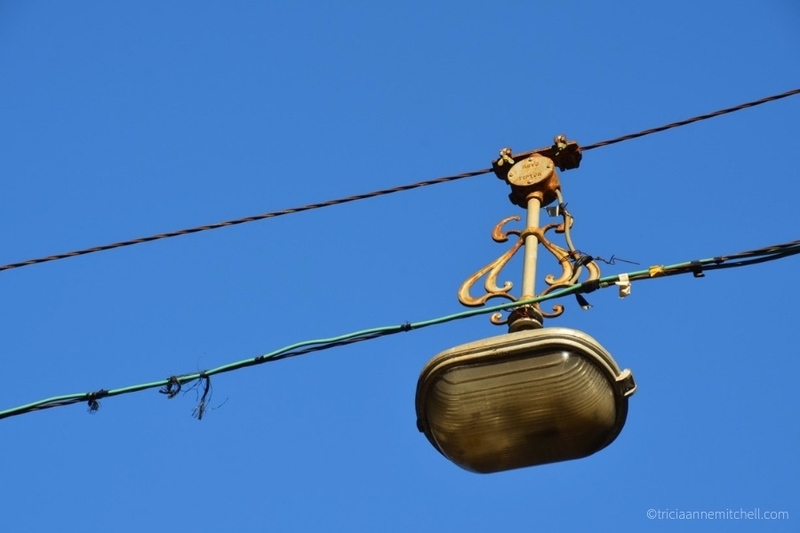 A vintage-style streetlamp hangs over a hilly street in Valletta. An enclosed wooden balcony (known as a gallarija) in the town of Mosta. Sailing past Malta’s sister island, Comino. The island only has 4 permanent inhabitants and it’s named after the cumin spice that once thrived there. 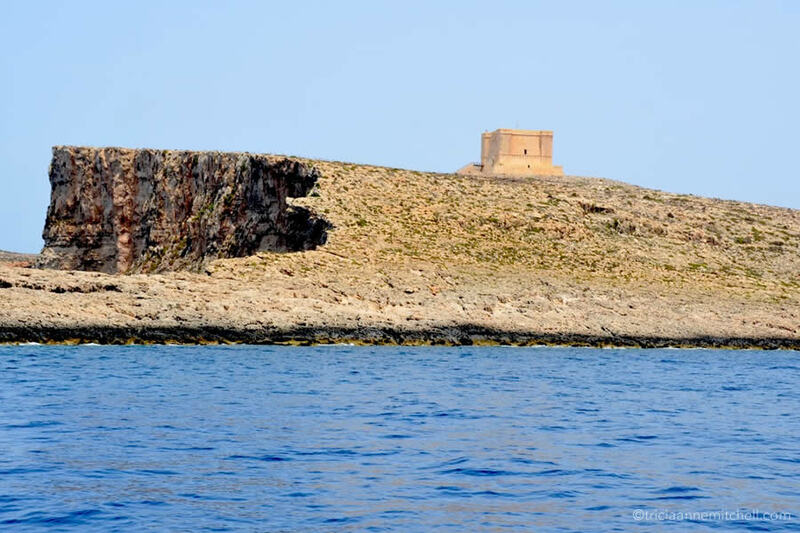 Comino’s most iconic structure is the 17th-century St. Mary’s Tower, which was featured in the 2002 film, The Count of Monte Cristo. 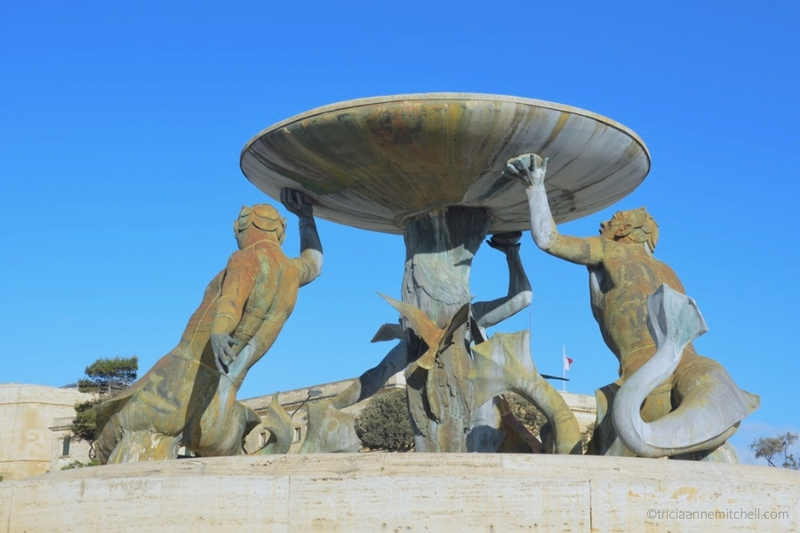 Three figures appear to hold up Valletta’s Triton Fountain. People stroll past Malta’s Parliament Building by night. 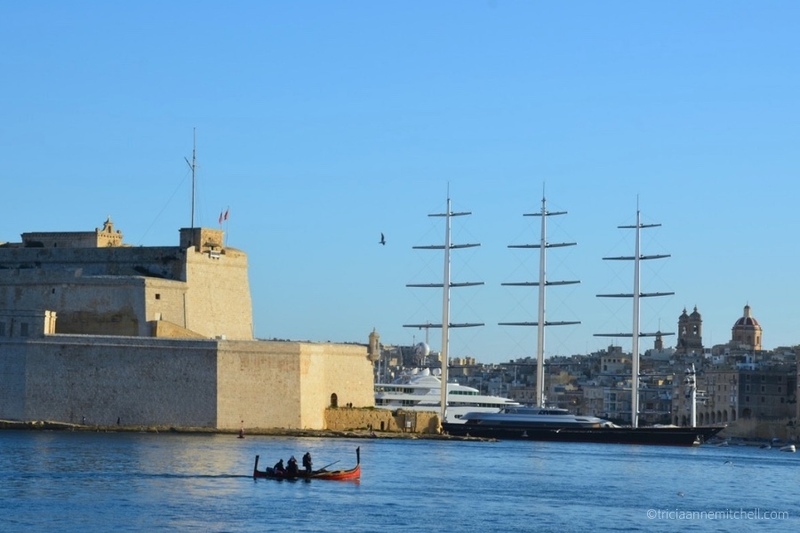 This Valletta structure was designed by renowned architect Renzo Piano. 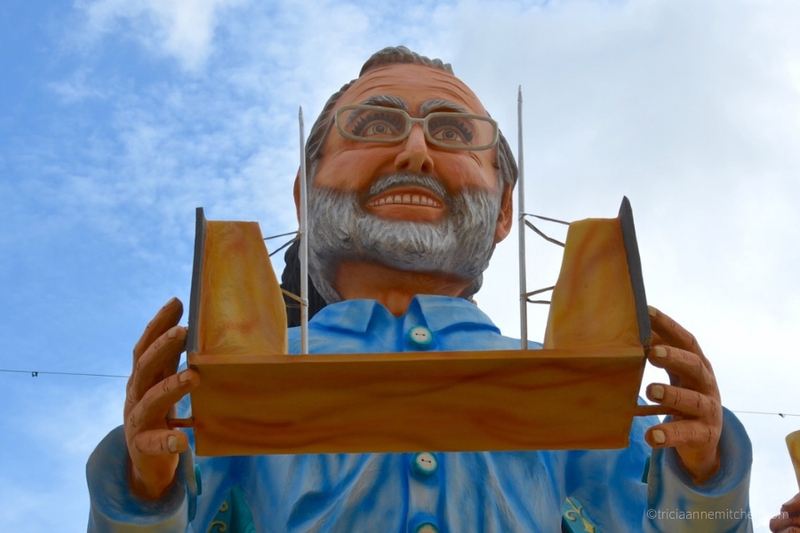 Renzo Piano is depicted in a parade float during Valletta’s annual Carnival celebrations. He is holding a miniature version of the City Gate, which he designed. A float prepares to pass through Valletta’s City Gate during the city’s annual Carnival parade. A Valletta street is festooned with Christmas lights. 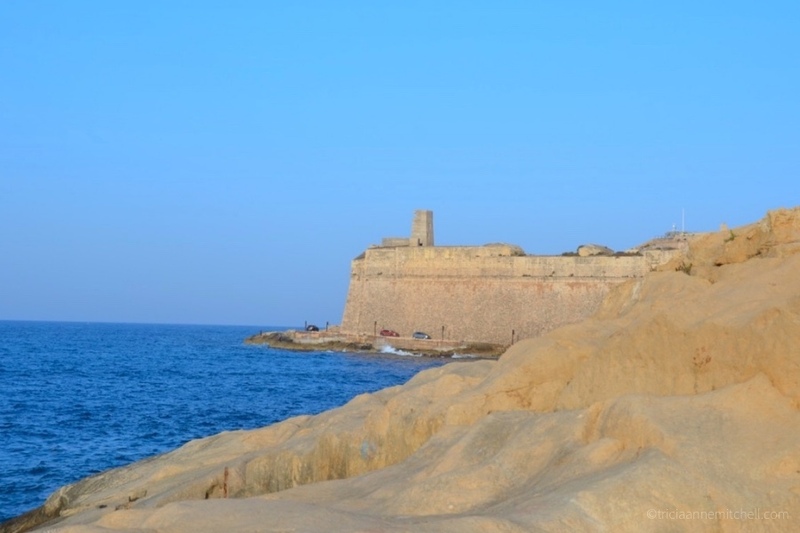 For more information about this tiny, but scenic island nation, peruse Malta’s Official Tourism Site. If you need more trip-planning inspiration here is an index of all my posts from Malta. Johann, I haven’t had the chance to say this for a while, but “grazzi ħafna” for your kind words. I’d actually started this post back when we were living in Valletta. Since I’m now feeling a bit sunshine-deprived, it was fun reliving our time in Malta, if only virtually. Shawn and I miss our weekend explorations in the Maltese countryside, including some places you inspired us to visit thanks to your posts. As for the noise, I’m sorry you sometimes experience that as well. I realize it can happen anywhere in the world. We like kids, but we had a tough time because these little ones were often running and screaming until three or four in the morning. Otherwise, we loved life in Valletta! Speaking of Valletta, have you been to many Valletta 2018 events this year? I imagine it’s a special time to be there. Wish you and your wife a lovely weekend! I’m afraid we haven’t been to any of the Valletta 2018 events; the expectation of crowds and the associated traffic doesn’t really help. Just this weekend we were in Valletta to meet up with a couple of friends for a lovely dinner; I had to not been to Valletta in a long time, except for occasional work-related things during the day. I must say it has become a great place to enjoy an evening. Ah, how I miss those walks in the countryside! Shawn and I greatly enjoyed exploring the lesser-visited historic sites, which had our imaginations working overtime (wondering if the Temple Builders had been in a given place, etc.). I can understand why you’re reluctant to head into Valletta for the 2018 events, since short journeys on the island can take a long time when traffic is heavy. I do miss living in Valletta, though. We’d often walk outside of the fortifications (past the Boom Defence), and surprisingly, there were never many other people out there. Also, being on Strada Stretta, we were often in a prime position to enjoy the cultural offerings. They had an Edith Piaf night one evening, għana, jazz, and classical music events. Are there still a fair number of buildings that have yet to be refurbished? I wish I had considered investing in an apartment during my first visit back in 2006. 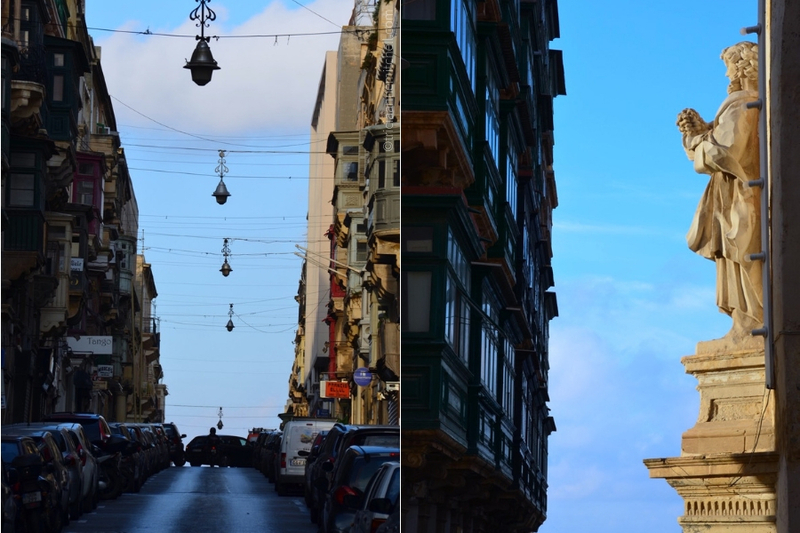 Back then, it seemed that Valletta was a ghost town. Now, as you said, there’s so much life in the capital city, making it a lovely place to enjoy an evening. What spectacular photos, so good. Malta looks idyllic. Always wanted to visit but never managed to make it there yet. Many thanks, Jonno! Here’s hoping that you have the chance to explore Malta. For being a small island nation, there’s a lot to appreciate there. Even after a year, we didn’t get “island fever” simply because there were layers and layers of history to explore. Always believed that it was a pretty expensive place to visit though Tricia? Not sure if that’s still true or not. Real estate prices have skyrocketed in some parts of the country, and we did find our rent in Valletta to be somewhat high for what we got. We also found food and electronics to be priced higher than they are on the mainland. Sounds like I need to have a serious look into it. If you decide to go, let me know if you have any questions. Thanks Tricia, I’ll have a read of those later. Much appreciated. Thank you, Merrill! 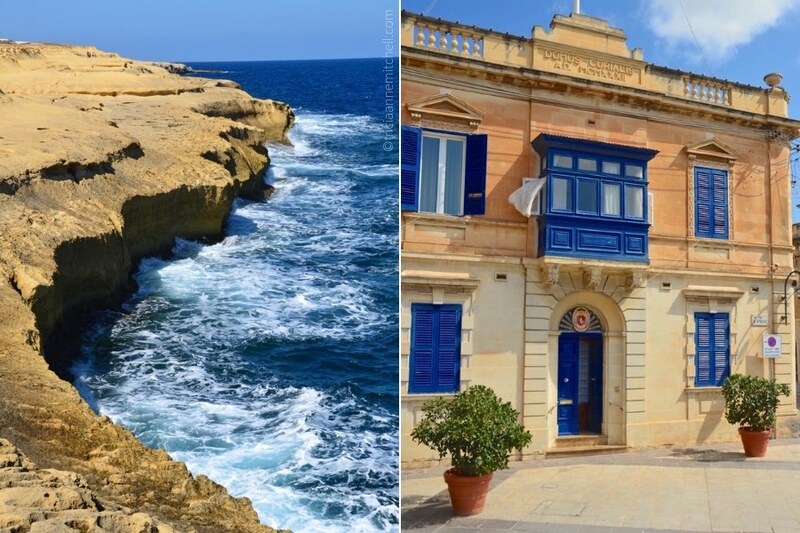 They’re an eclectic bunch of images, but I like how they showcase the landscapes and highlight some aspects of Maltese culture. In fact, working with them made me a bit nostalgic about our time there. Such beautiful captures of Malta, Tricia. It seems to be a treasured island. Thank you for sharing your talent , how to explore beautiful places. Hello Cornelia, and many thanks for your thoughtful comment. Malta does have a lot more to offer beyond its beaches; in fact, that’s where most of the “treasures” can be found. I feel fortunate that we got to call this tiny corner of the Mediterranean home for one year, and someday I hope we can get back and see the spots we missed (there are still several gardens and prehistoric sites on our must-see list). Marilyn, thank you for your comment, and for sharing these links. Having never been to Oaxaca, I enjoyed learning about how the cultures overlap through castillos and projections! 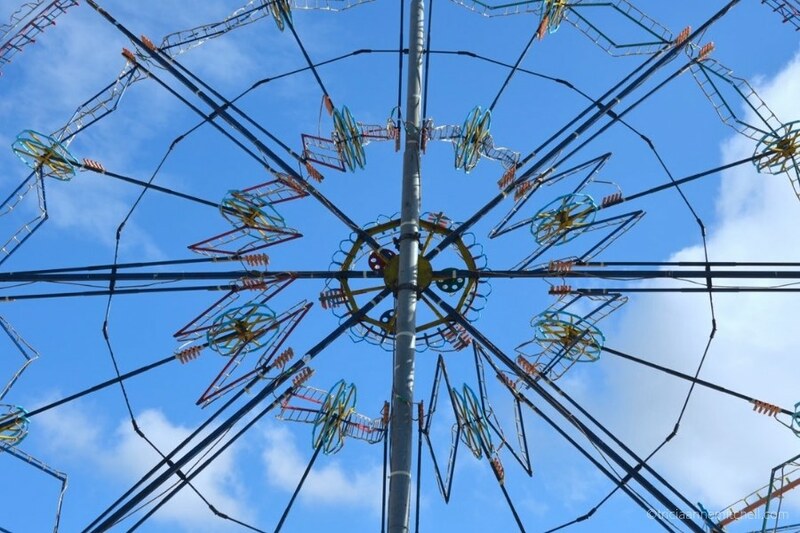 The castillos are a supercharged version of Malta’s ground fireworks — that’s incredible how tall they are. In Malta, we’d sometimes read about people getting injured (either at fireworks factories, or when crafting the display). For that reason, we were like you in that we kept a safe distance from them. Hello dear Virginia, I’m happy this series of images could add a splash of your favorite color to your day. A fresh blue & white or a moody blue-grey have always been favorites of mine, too. For that reason I’d love to visit Chefchaouen, Morocco or Jodhpur, India, as well. Wishig you a wonderful start to the new week! This is a beautiful gallery of images, Tricia. It looks like we could spend a couple of weeks exploring Malta. Carol, I’m glad you enjoyed this peek at Malta, and thank you! I know that some people breeze through Malta in a few days, but there is a lot to see and do — especially if you enjoy historic sites. We generally did our exploring on Sundays, and even after a year there, there were still sights we wanted to see, or walks we’d hoped to do. The country is densely-populated, but if you find the less urban areas, there’s lots of fun exploring to be had. Fabulous pictures, Tricia. They capture Malta so well. The blue there is so vivid. I remember your post about Titti. I love him so much. Maybe I should include him in my Malta book. Darlene — thank you! There is something magical about the intensity of blues and the quality of light in Mediterranean spots, don’t you think? I imagine you experience much the same in Spain. Lovely photos! Enjoyed the the blue post, we hope to visit Malta next year! D Gal, here’s hoping that next year’s trip will materialize! Do you have a certain time of year in mind to visit? Malta can make a great year-round destination, unless you’re hoping to spend some time at the beach. It can be a tad rainy during the winter months, but there’s just enough sunshine to keep things quite pleasant. Thank you, Emma! The skies are grey in Germany today — perhaps the same in Finland? 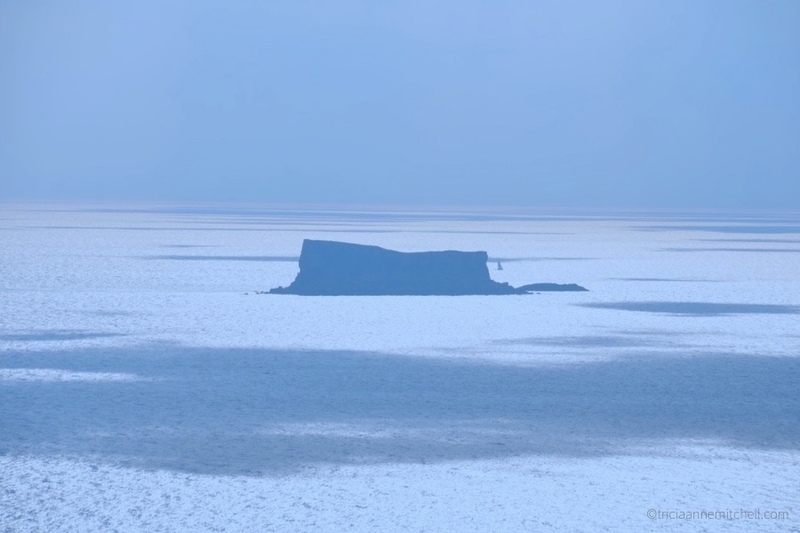 :) — and so a dose of Maltese blue is good for the soul. Emma, certainly this is “make your own kind of sunshine” weather. And yes, Germany’s Christmas market fest food, decorations, and cheer help drown out any cold-weather grumpiness! My husband and I were married in Heidelberg, Germany in mid-December and had some of our photos snapped inside Heidelberg’s twinkling Christmas market. The vibrant reds and golds, contrasted with the new-fallen snow made for a picturesque evening. Which German market are you planning on heading to? Beautiful post. I like the color Blue so much….that I named my son “Neel”; which is Blue in few other Indian languages. Raastha, how nice that your love of blue led you here! Out of curiosity, in which Indian languages does “neel” mean blue? I’ve visited Delhi and the so-called “Golden Triangle” as well as some of the south (Mumbai, Kerala, and Munnar). I’d love to return!